Common descent is a principle of Darwinism which holds that life on Earth evolved from a common ancestor. Darwin's theory of descent with modification led inexorably to this conclusion as is illustrated in the following quote from Prentice Hall Biology (2008). The theory draws support from homology (physical similarities), embryology (developmental similarities), and the geographic distribution of organisms. By contrast, creationists believe that God created many kinds of organisms, and that innumerable species developed from those original kinds through microevolution via inherent genetic variability and natural selection. That tigers, panthers, and cheetahs share a common ancestor is a view accepted by most young earth creationists. However, the belief that biological evolution supports that these felines share ancestors with horses, dogs, and bats is a point where evolutionists and most creationists part ways. 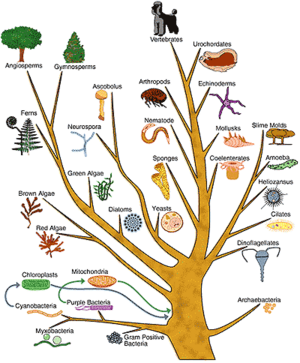 Belief in common descent is largely derived from the existence of homologous structures shared by many forms of life. Homologies may include structural (morphological) components, such as the forelimbs, which illustrate a similarity of construction overall, but are yet unique in other ways, providing varied functions. Cellular and molecular similarities are also considered to be derived from a common ancestor and therefore homologous, as in the existence of common organelles in eukaryotes, and nucleic acid (DNA/RNA) as the universal genetic code. Such homologies (similarities) are used as one of the main proofs for macroevolution and the common descent of all life on Earth. Based on these observed similarities, evolutionists infer that all life is related through one original life form that generated naturally through abiogenesis. Creationists on the other hand infer that life and the natural laws that sustain it were designed by a common Creator, namely God, Who supernaturally created many original kinds of animals. It is important to note that creationists do not reject fully the idea of common descent, only its ultimate evolutionary conclusion. Since the time Darwin published The Origin of Species, embryology has been used to support common descent. In fact, Darwin referred to embryological homology as the strongest single class of facts that existed to support his theories. A theory later put forth by Ernst Haeckel, known as the biogenetic law, asserted that the evolutionary history of an organism was recapped during embryo development. Although the biogenetic law is now discredited, in recent years, embryology has reemerged as a tool used by evolutionary biologists that attempt to establish phylogenetic relationships by identifying developmental similarities between taxonomic groups. Evolutionary developmental biology is a merging of developmental biology and evolutionary biology that is commonly known as "evo-devo". Challenges to the theory of common descent are numerous. It is especially important to realize that modern evolutionists are now refining their original theory of common descent to one that now includes more original life forms at the beginning. They have argued against a single-celled evolution and thus posit the original existence of no less than three "loosely constructed cellular organizations." Charles Darwin's notebook showing sketch of a phylogenetic tree. Charles Darwin's "tree of life" is not born out in scientific observation. This is concluded through more modern research, on example of such coming from the Proceedings for the National Academy of Science (PNAS). The research found that "there is no independent evidence that the natural order is an inclusive hierarchy" and that "the only data sets from which we might construct a universal hierarchy including prokaryotes, the sequences of genes, often disagree and can seldom be proven to agree." 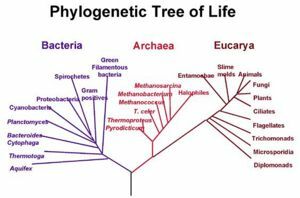 There are what are called evolutionary "bushes," but according to Public Library of Science (PLoS) research, these bushes do not support the conclusion of a single cause of a complete tree of life as proposed by Darwin. The asserted improbability and impossibility of this completely naturalistic mechanism is a severe problem for modern evolutionists. Abiogenesis is the spontaneous appearance of the first, self-replicating protocell which can be argued has neither been observed nor comprehensively explained. Differences in morphology, or "gaps in the fossil record," exist, across which it is argued there is no fossil evidence of transitional forms. For example these gaps are glaring when the context between reptiles and mammals, reptiles and birds, or apes and men is understood. Because of the absence of substantial hard evidence to support belief in common ancestry, creationists and even some evolutionists acknowledge that evolution is a philosophical belief, not scientific in essence. Evolution is referred to as a fact without providing sufficient explanation for the means. 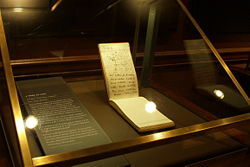 The assertions made by evolutionists are often not falsifiable and cannot be observed in nature or tested by experimentation. It therefore, falls outside the boundaries of the scientific method. Common ancestry is an ancient idea, articulated by many pagan philosophers throughout history. In Europe, it fell from prominence when Christianity was dominant, but regained popularity in the 19th century, with secularization. It is an ancient idea, held by ancient pagan philosophers such as Anaximander as early as the 7th century BC, and returning to popularity in 19th century Europe. Plutarch, Symposiacs, Book viii, question viii: Anaximander founded the first school of Greek philosophy and lived circa 610-546 BC. The Temple of Nature in 1802. ↑ Jeriström, Pierre. "Is the evolutionary tree turning into a creationist orchard?" Journal of Creation 14(2):11-13, August 2000. Accessed October 16, 2008. ↑ Barlow, Jim. "New cellular evolution theory rejects single cell beginning." News Bureau, University of Illinois at Urbana-Champaign, June 17, 2002. Accessed October 16, 2008. ↑ Rokas A and Caroll SB. "Bushes in the Tree of Life." PLoS Biol 4(11):e352, November 14, 2006. doi:10.1371/journal.pbio.0040352 Accessed October 16, 2008. Darwin's Failed Predictions, Slide 9: "Saving the Tree of Life" (from JudgingPBS.com) by Casey Luskin. January 2, 2008. This page was last modified on 24 November 2017, at 21:23.